The image has a resolution of about 710 meters per pixel horizontally and 900 meters per pixel vertically, so it covers an area about 710 by 900 kilometers square. This landscape is actually covered not with "wispy terrain" (that's found elsewhere in the solar system) but instead by "grooved terrain." And "groovy" is synonymous with "Ganymede," at least if you're a planetary geologist. Ganymede is, of course, Jupiter's largest moon -- the largest moon in the solar system, in fact. Galileo swung close to Ganymede on December 28, 2000 to capture the images for this observation of its surface. Ganymede is a wonderful puzzle. It has two major types of terrain, "dark" and "light," both of which are visible here. The dark terrain is clearly older than the light terrain, because the grooves in the light terrain crosscut the dark terrain and because the dark terrain is more heavily cratered than the light terrain. But the story's much more complicated than that. In most places, the light terrain is sliced up by grooves that cross and cross and cross each other, so there's a detailed geologic history to be told by unraveling their interrelationships. And both are cratered, so these things happened a long time ago. 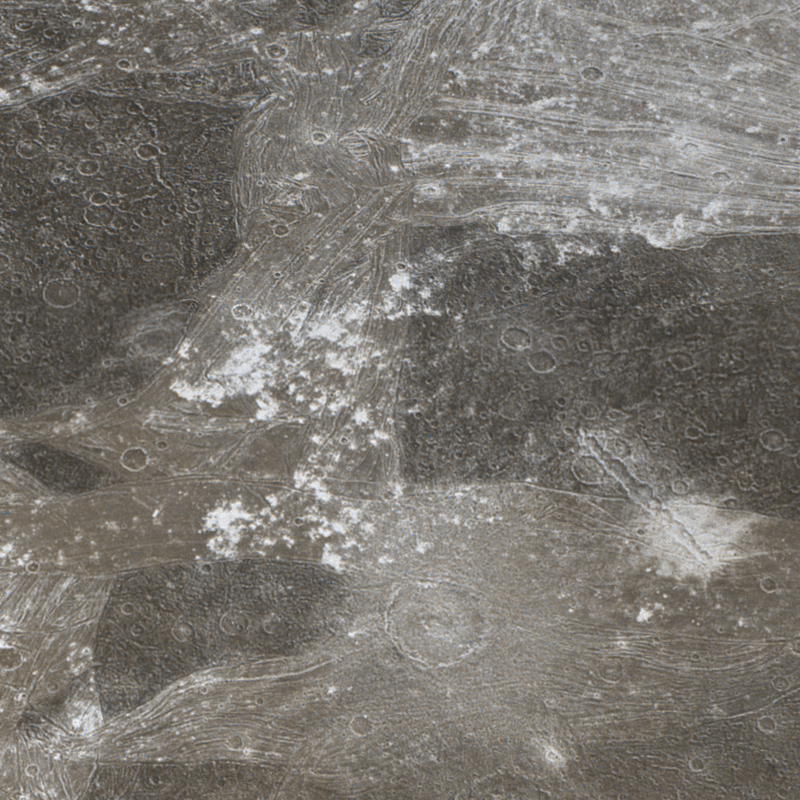 It's taken many years to unravel this story; a definitive paper on the geologic history of Ganymede as revealed in maps of Galileo images appeared in Icarus earlier this year. The images that Galileo took here were in green and violet wavelengths, so Gordan Ugarkovic created a synthetic red-filter image to make the color view.